Extreame Savings! Up to 42% off on Jeans at Felicianeo. 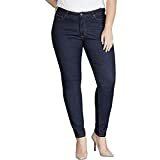 Top brands include Ellos, Chic Classic Collection, Fashion2Love, Levi's, Dickies, Wrangler, Signature by Levi Strauss & Co. Gold Label, NYDJ, Riders by Lee Indigo, Woman Within, maurices, & WallFlower. Hurry! Limited time offers. Offers valid only while supplies last.